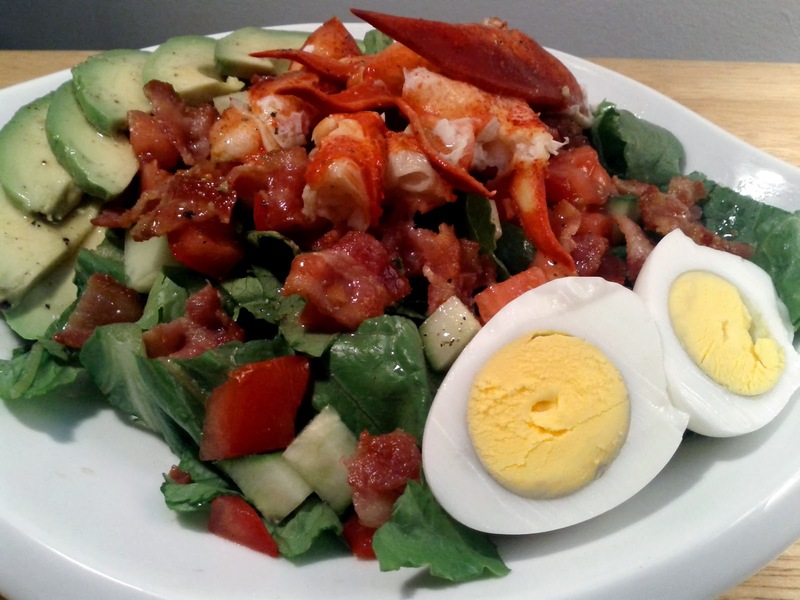 Want to make a fun twist on a classic Cobb Salad, instead of chicken, use lobster! As Mark McEwan would say, "A cobb salad is a meal in a bowl". 1. Cook claws or tails from fresh, or frozen. If from frozen and it's already cooked (if it's red), than just let it thaw in the fridge and it will be ready to use for the salad. If you need to cook it, just boil it in hot water for maybe 5 minutes. If it's a tail, you'll know it's done when the tail is red and has curled. If you do cook it, make sure you let it cool off before you add it to your salad. 2. Hard boil some eggs. In a post, cover your eggs with water and bring to a boil with the lid on. Once the pot is boiling. Kill the heat. And let it sit for 20 minutes. This will help ensure you don't overcook the egg. 3. Fry some bacon in a pan, and once its done remove to a cutting board and chop into bit size pieces. Set aside and let it cool. 4. Chop tomatoes, avocado, cucumber, and lettuce all into bite sized salad pieces. Make a vinaigrette (3 parts oil, one part vinegar) with olive oil, white wine vinegar, salt and pepper. And maybe dijon mustard if you want to help it bind even further. 5. Take your vegetables for your salad and arrange them on a plate, along with the hard boiled egg. Then top with your chunks of lobster and bacon. Drizzle dressing over top.